Wake Forest University was founded in Wake Forest in 1834 by the North Carolina Baptist State Convention as a "literary and manual labor" school for young men. By 1838, however, the manual labor component was dropped, and Wake Forest College became a liberal arts college whose mission was to provide education for prospective Baptist ministers. The college quickly established itself as a respectable liberal arts institution, growing slowly but steadily throughout the nineteenth and early twentieth centuries. With the aid of a wealthy Winston-Salem family, Wake Forest's Bowman Gray School of Medicine was founded in 1941. That same year the undergraduate school was awarded a chapter of Phi Beta Kappa. By 1949 student enrollment had grown to more than 2,000, and the schools of business administration and religion were established. But the decade of the 1950s brought the most significant change to the institution since its founding. With the promise of major financial support from the Z. Smith Reynolds Foundation of Winston-Salem, the trustees of Wake Forest College and the Baptist State Convention agreed to move the campus from the town of Wake Forest to Winston-Salem. Under the leadership of Harold Tribble (1950-67), the move was completed in 1956, and the old campus was sold to the newly formed Southeastern Baptist Theological Seminary. In 1967 Wake Forest College became Wake Forest University. In 1979 a new relationship was initiated between the Baptist State Convention and the university by which the century-old ties with the Baptists were loosened. By the terms of this new relationship, the institution relinquished funding that came through the Baptist Convention and received more flexibility in the selection of future trustees. Wake Forest University by the early 2000s had a total enrollment of nearly 6,500 students and offered 34 academic majors. In addition to the Bowman Gray School of Medicine and the Wayne Calloway School of Business and Accountancy, the university has a law school, a graduate school in arts and sciences, and a divinity school. George Washington Paschal, History of Wake Forest College (2 vols., 1948). Youngblood, Seth. 2011. 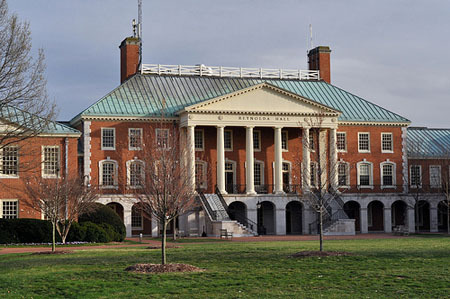 "Reynolda Hall." Online at Flickr at http://www.flickr.com/photos/whateyesee13/5512724174/. Accessed 7/3/2012.